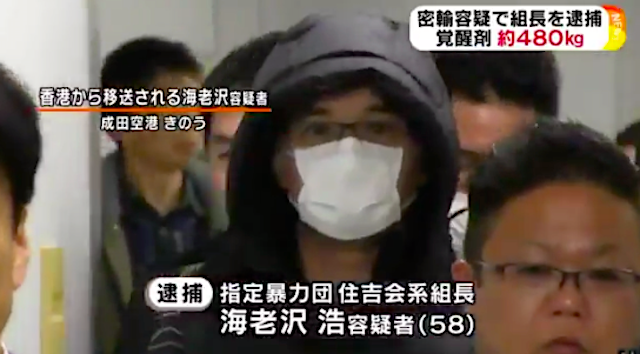 TOKYO (TR) – An organized crime boss wanted in connection with the smuggling of more than 470 kilograms of stimulant drugs in Ibaraki Prefecture two years ago has been extradited from Hong Kong to Japan, reports Kyodo News (Jan. 13). On January 11, Hiroshi Ebisawa, the 58-year-old boss of a gang affiliated with the Sumiyoshi-kai, arrived at Narita International Airport in Chiba Prefecture. Police plan to accuse Ebisawa over the smuggling of more than 474 kilograms of kakuseizai — or stimulant drugs — with a street value of more than 3 billion yen seized in Hitachinaka City, Ibaraki in August, 2017. Ebisawa had been on a wanted list with Interpol. Police in Hong Kong apprehended him in November. According to a previous report, it is believed that an international trafficking group was behind the smuggling. Police suspect the contraband was landed at Hitachinaka via boats operating off the coast. Thus far, police have arrested at least 20 persons, including several gang members.